Studio apartments can offer efficient living in downtown Wichita. If you are searching for an affordable studio apartment in Wichita, Bokeh Development has plenty of loft and studio apartments that are the perfect place to call home. The LUX, Zelman Lofts, and The Renfro have downtown Wichita studio apartments for rent. Each of these buildings are just a short walk away from a number of restaurants and entertainment. 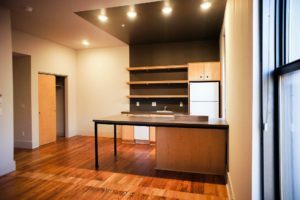 If you are looking for cheap studio apartments with great amenities or to rent studio apartments, we have a number of available studio and loft studio apartments in Wichita! The possibilities are endless when you live in a Bokeh Development studio apartment in Wichita, Kansas. Bokeh Development offers affordable studio apartments, so no matter your budget, we’re sure to have an option for you. We have a number of available studio apartments in Wichita, so be sure to take a look at our downtown Wichita studio apartments and studio apartment floor plans here or schedule a visit today!